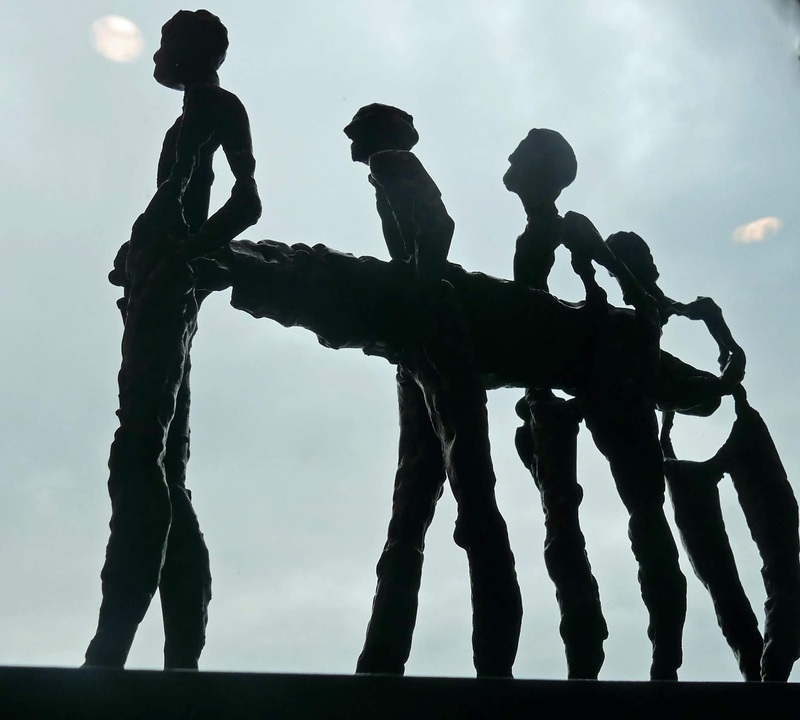 Art and the Great Hunger is an exhibition of the world’s largest collection of famine related art and is being shown for the first time in Ireland. 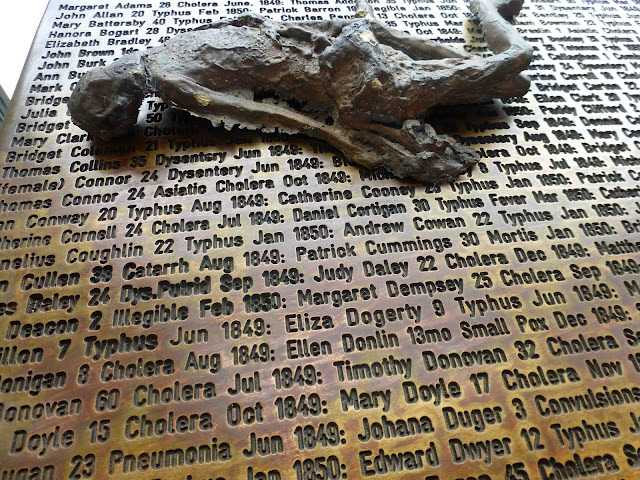 The collection, from Ireland’s Great Hunger Museum at Quinnipiac University in Connecticut, constitutes a direct link to the past of almost 6.5 million Irish, and 40 million Irish-American people. The exhibition may be viewed at Uillinn, West Cork Arts Centre in Skibbereen until 13 October 2018 (Monday to Saturday: 10.00 am to 4.45 pm) and will be in Derry after Christmas. The exhibition website: The death and dispersion of 2 million people, followed by a further 2 million emigrations to the end of the century, makes the exhibition an important gesture of cultural reconnection. The Irish diaspora defines Ireland’s place in the world today. The impact of the Famine is still with its descendants—both at home and abroad. Walk in here to the Uillinn and you will cry, silently perhaps, but you will weep for the individual losses and the communal loss that dealt a close to knockout blow to the Irish nation, a blow that still reverberates. Who knows how this country would now stand if the four million needlessly lost to us through death and emigration had remained fed and healthy. One poor soul has reached the end of the hungry road in John Coll's Famine Funeral (above), the corpse carried by a quartet who themselves are on their last legs, each wondering who will remain to carry him. And will there be someone there to identify him and make sure he is buried in consecrated ground? Many weren't given that privilege, vagrants and new-born babies among them. The exhibition features works that focus on the time of the famine and its aftermath. Paintings dominate but the handful of sculptures, most of them modern, make powerful statements just like Famine Funeral. Many escaped the famine by boat only to die on arrival in New York and they are honoured by Rowan Gillespie's Statistic 1 & 11. There are paintings by well-known artists such as Jack B. Yeats and Paul Henry. Many paintings tell of emigration, a living death as most of those about to board ship were never to return. Gorta, a stark and powerful work, tinged in blue, by Lillian Lucy Davidson, depicts a poorly attended funeral. A child is being buried. The few relations have nothing and face a future of nothingness. One fingers a rosary beads. Eli Eli lama sabachthani? (My God why hast thou forsaken me?). Accompanied by a rich and diverse programme of performances, talks, lectures and events at Uillinn, and off-site in other locations in West Cork, Coming Home is a unique opportunity for the people of Cork and visitors to the region alike to experience artworks by major Irish and Irish American artists of the past 170 years such as Jack B. Yeats, Daniel MacDonald, Paul Henry, William Crozier, Hughie O'Donoghue, Dorothy Cross and Alanna O'Kelly. 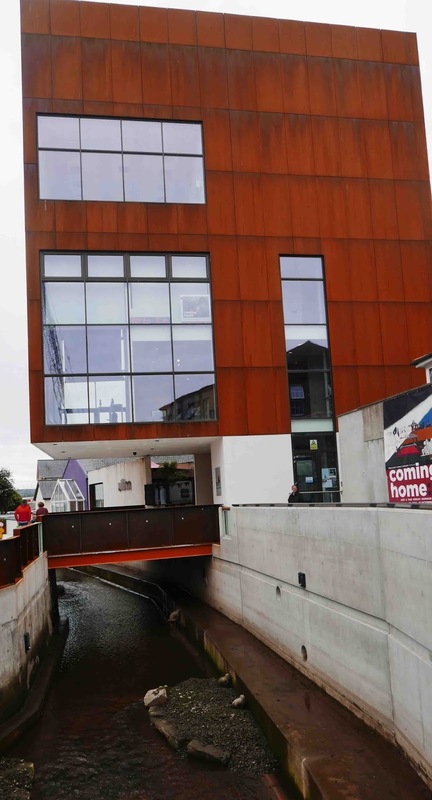 See it in Derry( January-March 2019). Explore the West Cork schools programme; a series of artist residencies in association with the Crawford Art Gallery and University College Cork; a unique performance by acclaimed Irish artist Alanna O'Kelly for Schull Workhouse, Anáil na Beatha; a reading by Jeremy Irons of The Cummins Letter – a letter written by a local JP, in 1848, to Wellington describing conditions on Reen and appealing for help, taking place at Reen Farm Sculpture Garden, where internationally renowned artist John Jelly lives with his family; a celebration of the legacy of young women who emigrated to Australia after the Famine called 110 Skibbereen Girls; Chronicles of The Great Irish Famine concert with Declan O’Rourke and guests. There are the Famine Stories Walking Tours, garden trails at Reen Farm Sculpture Garden, an artists talk in the gallery with Robert Ballagh, the world premiere of Rua Breathnach’s Welcome To The Stranger at Skibbereen Town Hall, the Canon Goodman Concert with Lúnasa, Point Of Departure: A Lament film screening and drama workshops for children, a poetry reading by Cherry Smyth of her long form poem Famished as well as day long field trips, family friendly Discovery Boxes and numerous Heritage Centre Talks. Coming Home: Art and the Great Hunger is a major historical, cultural and educational event, spreading throughout West Cork and over 3 months, that should not be missed. 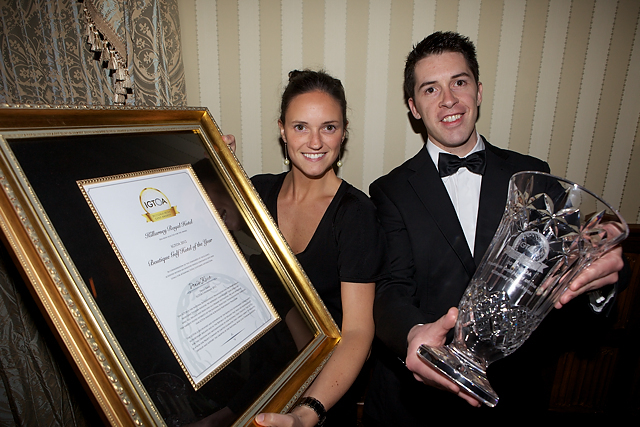 Visitors to A Taste of West Cork, take note! See it in Derry( January-March 2019). 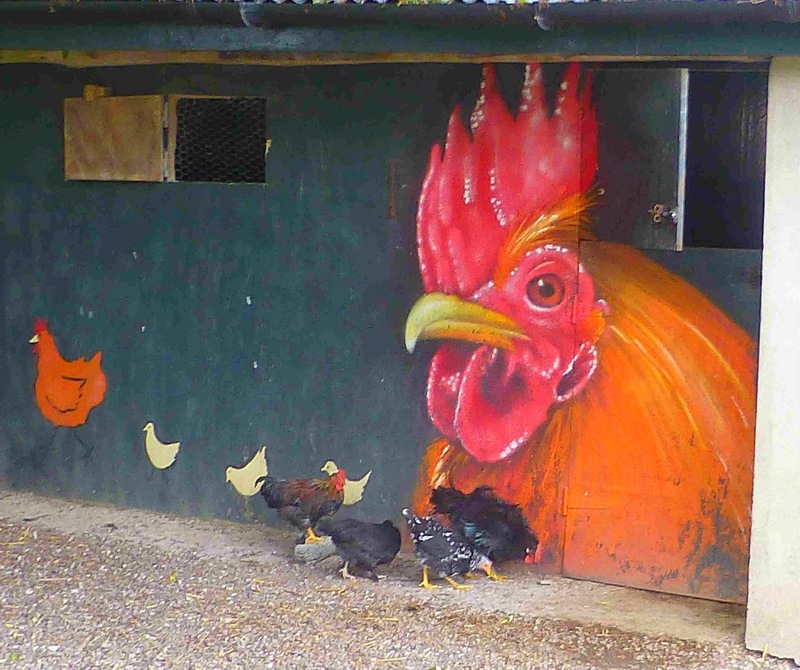 Ballymaloe is a working farm, producing magic by the moment. I went through the looking glass last Wednesday and, in a few short hours, sampled this incredible place. With Colm McCan as our guide, we passed the Palais des Poulets and stepped into a one acre bubble where all kinds of vegetables grow organically under the warm shelter. 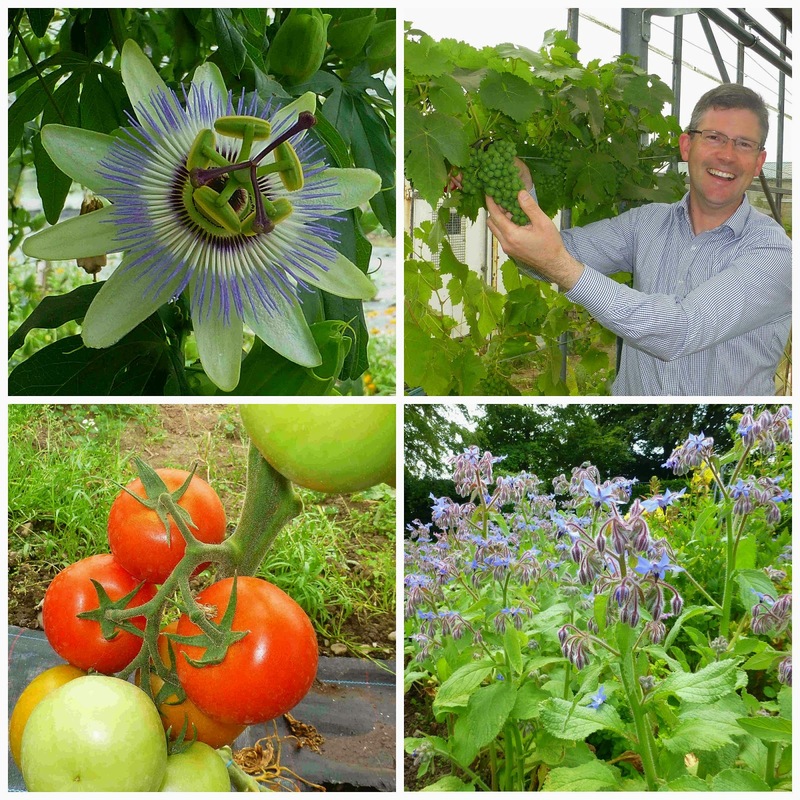 And so too do a selection of vines, though even the enthusiastic Colm knows that more magic will be needed if the fruit of these East Cork plants is to be turned into wine. A fertile Allen imagination is at work in the calm warm place. One segment of the shelter has a newly laid carpet, of grass. Here later in the month, one hundred people will sit down for the Long Table Dinner, a night of fine food and conviviality. Many tales illustrate the 30 year old story of Darina Allen’s Cookery School and we mingle with the students for lunch. The starter is pea soup. Sounds mundane enough. 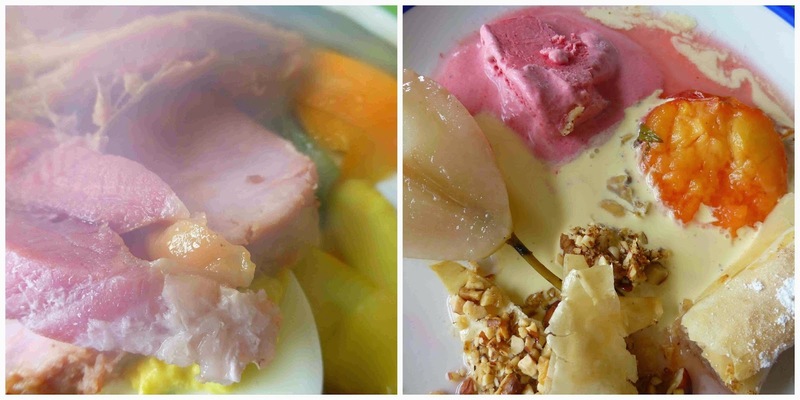 But it was excellent and the main course, with the Belly Bacon an outstanding feature, was incredibly delicious. And the magic was sweetly evident on the dessert plate, emphasized by that natural cream from the Jersey cows, a memory of good times past but very much part of the present reality here in Ballymaloe, provided by six Jerseys that yield the milk for the table and for the students to make their butter, cheese and yoghurts. Man does not live by bread alone, though I could think of a worse diet than that emanating from the Ballymaloe ovens. Colm now directed us to the gardens, starting with the herb garden, based on the legendary gardens of Villandry. May not have quite the scope of the Loire chateau but Ballymaloe has its surprises, including that unforgettable After Eight Mint (one of many varieties, including Banana and Orange). Dinner. Check out that Jersey cream on the dessert plate! Soon we were into the herbaceous border, a magnificent example of the type, and heading for the Shell House, hardly a house, just a very small building but unforgettable. Here, some 20,000 shells have been artistically arranged (by Blott Kerr Wilson in 1995). 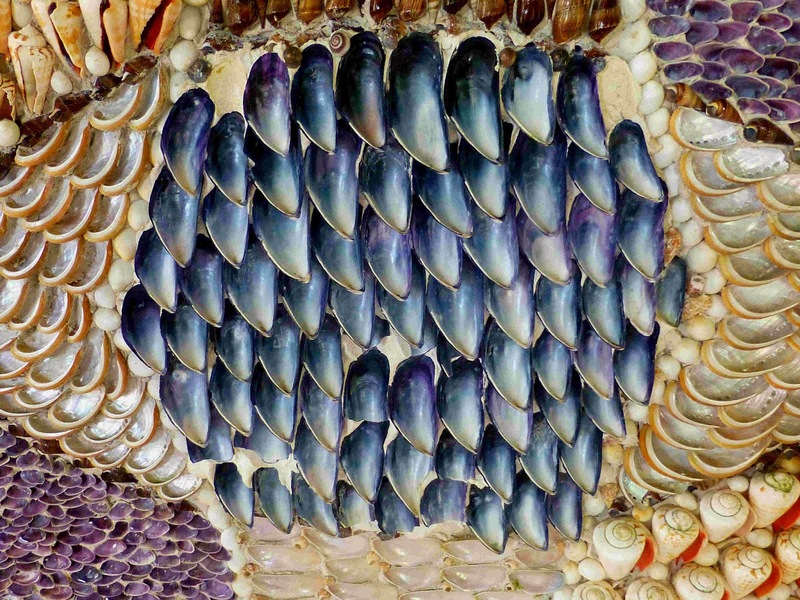 You'll never look at mussel shells or scallop shells in the same way again. The gardens and shell house are open to the public and there is a charge. Back in the main house, built around the remains of a 15th century Fitzgerald castle, part of which still stands, we went down to the wine cellar in the rock on which the buildings stand. Here lay treasure! Colm handled some of the great wines of the world with care and, like a good Corkman, I just looked, eyes and mouth open! Time now for a reviving cup of coffee and where else would you go but to the tig beag, the roasting house of Mark and Golden Bean, right next to the well known wine and entertainment venue, the Grain Store. 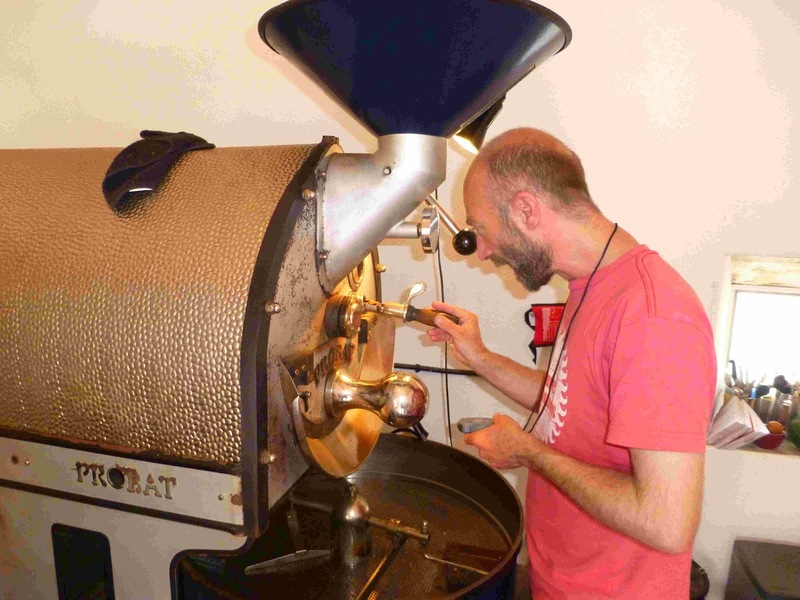 Mark was roasting a few kilograms of Ethiopian beans so we waited for the crack and soon we were sampling, via his AeroPress, the freshest coffee we had ever tasted. Mark, by the way, has a new outlet for his excellent coffee and soon you'll be able to buy and drink it at the Princes’ Street store, just opened (02/07/14), by The Rocket Man. Now for a little cultural exercise, in the environs of the house and the field outfront. Colm introduced us to Richie Scott, the exhibition's coordinator. Richie would be our knowledgeable guide on the sculpture trail which features a walk into the middle of the cornfield to see some of the exhibits. Richie first assembled FORM for Mount Juliet last year and now this revised version will be in Ballymaloe until September 28th. There is something for everyone here: some humorous pieces, some severe, large scale pieces and small, abstract and figurative. You may not like every piece but do bring the kids and let them loose; take your time as you walk around and let your eye wander and allow the magic in. My favourite, in this first walkabout, was perhaps Holger Lonze, especially The Large Seabird. 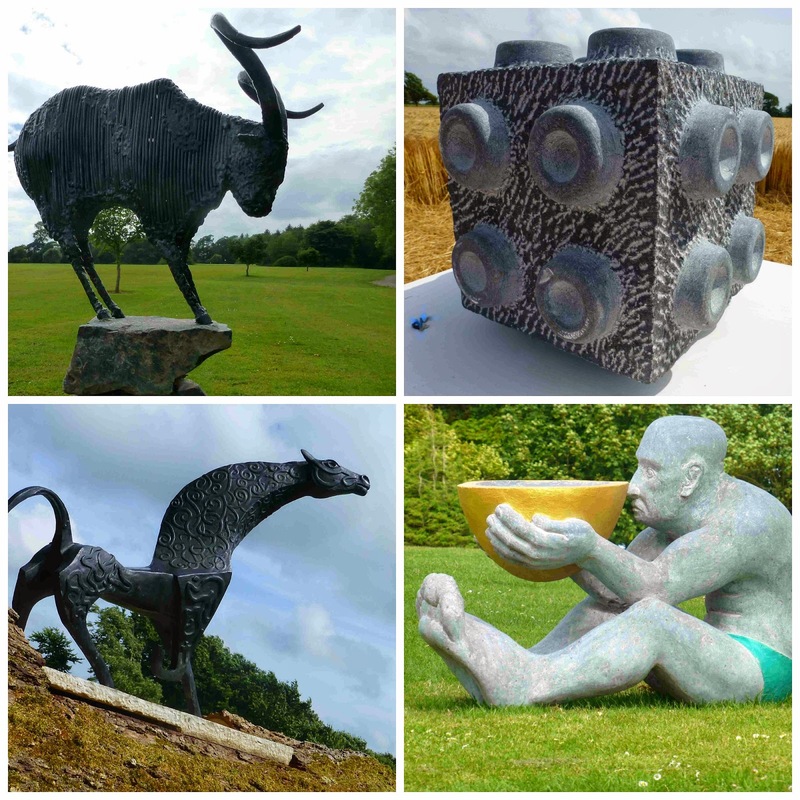 Enjoyed too the quirky pieces, mainly in Kilkenny Limestone, by Eileen McDonagh. And what about that stranded surfboard, high and dry at the base of the big tree? Go see for yourself. No charge. Almost ready. Mark checks a roast. After quite a packed few hours it was time to say goodbye. But we’ll soon be back. Already the first date is confirmed. On Thursday, 24th July, at 7.00pm, a Krug Champagne tasting with Nicole Burke, Krug USA Brand Ambassador, will be held in the Ballymaloe Cookery School (note venue). Contact colm@ballymaloe.ie for further details and bookings. And all that magic? Probably the usual formula: 5% inspiration, 95% perspiration. 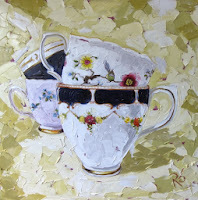 What better time to bring an exhibition of china teacups to Kinsale than during the Kinsale Gourmet Festival! Known for her colourful, sumptuous paintings of interiors, artist Róisín O'Farrell is introducing a collection of delightful paintings based on her Grandmother's china teacups that will go on exhibit between two venues this Tuesday to Sunday 20th October in the scenic harbour town of Kinsale. As part of the ever popular foodie weekend in Kinsale 11 -13th October her paintings will be on show in Fishy Fishy Restaurant and at The Gallery Kinsale on Main street. Róisín paints bright, vibrantly colorful paintings in textured, buttery oils with a contemporary finish. Her work is influenced by a sense of home, and feature warm, light filled period interiors, tumbled families of rain boots, and quirky china teacups. The beautiful antique china belonged to Róisín’s grandmother, herself a native of Nohoval near Kinsale. Like much of O’Farrell’s work the inanimate becomes characterful and in her hands this delicate 1930’s china becomes both contemporary and fun. Róisin’s Grandmother would have been delighted to see her treasured china return to Kinsale even if she may not have treated them in such a contemporary way. 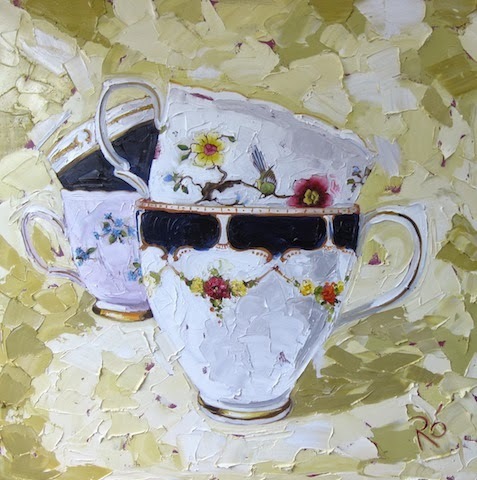 Impactful, beautiful and a little vintage, the teacups are set against the lush impasto palette knife backgrounds that have made O'Farrell a favourite. A ‘must see’ at the The Gallery.